Gor Mahia will play their first real match of 2018 this coming Sunday against arch rivals AFC Leopards. Kogalo will be defending the Super Cup diadem which they won by beating Tusker FC last January thanks to a Jacque Tuyisenge penalty. Aside from the Super Cup, its an opportunity for coach Dylan Kerr to test his charges in a high pressure situation especially new signings like the evastly experienced Humphrey Mieno, the returning Kevin Omondi, and the Ivorian Ephrem Guikan. But Leopards under Robert Matano and his spoiler tactics have proven a hard nut to crack. And Matano has sought to play down the significance of the game. For Gor Mahia, club official Ronald Ngala thinks the win over KCCA has buoyed the players. “We have played a couple of friendlies, the last one being against KCCA in which we beat them. I believe the head coach has marked some of the players including new signings who will be used in the Mashemeji Derby(weekend meeting). We won the Cup last season, and we are doing the same this season, so I am warning Ingwee to be ready for disappointments,” Ngala told Citizen Sports. The match kicks off at 3pM Sunday at Afraha stadium. Has the ever talkative FKF chairman or KPL managed to secure any prize money and sponsorship for this match? Our EC must quickly move from daily match scandal riddled ticket sales to season e-ticketing/ membership as the financial base for the club. All the best K’Ogalo against efusi. 2018 looks promising apart from the apparent financial challenges. Is their forward line sharper than Gor’s that was able to put four past the same KCCA despite playing with two different set of teams, one composed almost entirely of newcomers who have never played together before? @jasego….The guy has this imposing physique and used it well outmuscling KCCA defenders and robbing them of possession including the one he teed Blackberry with for the fourth goal. A quick turn of pace, never say die attitude and a lethal left foot……prepare for those goals where the goalkeeper does not realize he has conceded until he meets the ball rolling back from the net!!! BREAKING NEWS ! tusker have won the battle against Lawrence Juma who had signed for Gor Mahia. Football Kenya Federation (FKF) has ruled Lawrence Juma -should now play for the brewers. 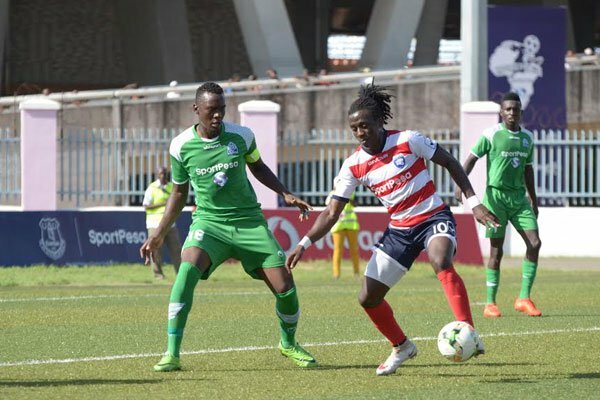 Elsewhere, as the deadline for sportpesa contract draws near, the two clubs Efusi and Gor through separate formal requests, have been instructed by sportpesa to play the super cup without sportpesa branded jerseys…more to follow ! A.Fixed Kshs 25 million annual sponsorship plus additional kshs 25 million ( add ons ) subject to the following conditions. A5. The contract is subject to annual performance and reviewed from time to time in light of the changes in Kenya regulatory environment. Discussions are ongoing but both clubs are reluctant to take the business approach. it remains to be seen if any meaningful agreement shall be reached before the league kick off. I thought the said LYN bought the rights to been the match live.So the club’s weren’t entitled to a share of that money.Who pocketed that cash?Was the Television rights just dished out?It costs money to prepare a a team for a match of this magnitude.Plus there could be injuries to key players.Better it be called off. Onge mano Jaupanda, nakataa. People cannot organize such a high profile match and fail to give rewards for winners. I have never heard of any competition merely for the bragging rights. It costs money to prepare a team for any match. I am sure the vultures are also waiting on the wings for whatever gate collections will be realized. However one looks at it , it does not make sense at all. Just the other day people were displaying huge cash rewards for HStars, what has happened now? NKT. But lets just go and play anyway, without Gor and AFC there is no football in Kenya. How about the gate collections being shared by both teams? at least that way no team leaves empty handed!! @Ja Thur gi ji. As you have said reward is crucial. It works as a motivating factor. I was trying to say that under the circumstances, we can still pull something positive out. My biased thought is that we can still set the right state of mind for the difficult journey a head. We should embark on the journey with a defeatist mind like efusi camp has already exhibited. Our victory however is that let us come out and rally behind our Team as always. I stand to be corrected but I have heard that the equivalent of Super Cup in England is/was the Charity Shield. Apart from the shield the earnings from the game is donated to a charity of choice. Why can’t we do it in Kenya? Sportpesa reinstates Ingwe sponsorship!!! !Any news about Gor Mahia? How do you donate what you don’t have in the first place! Do start being philantropic when you just lost your main sponsor? Have you paid all salaries and allowances etc, or is it the players emoluments that are being donated? If so, who is the donor-KPL,the clubs or the players? KPL is a big let down on this Super Cup issue, it has no relevance apart from being part of preseason preps for both clubs as they lack better or any other option. Surprisingly no official has cried out for lack of funding, Nakuru is suddenly secure enough for the most high risk match in Kenya! WHY? HOW? @musymo, that news of efusi contract is FAKE !!! its tactics to win sympathy from the sponsors. The offer to the clubs is still valid and is under discussion…………………. Seems so because i have been looking for the same news from other sources and cant get it…so futaa knows where they got that story!!! can someone tell me why every time ingwe wants to meet gor they must bring threats of boycotting the match.or do they just want a soft landing when we beat them eti hatukufanya practice ndio maana Gor wametutwanga 3-0! mimi kusasema napumsika. Wishing Kogalo victory against AFC in the Mashemeji derby at Afraha! IN VICTORY AND GLORY, IN DEFEAT AND AGONY, K’OGALO FOR EVER!! kogalo oyeee.our coach is at the top of everything and i know we will enjoy the game.